Buffalo released DDR3 with 2200 MHz | Its Madh !!! 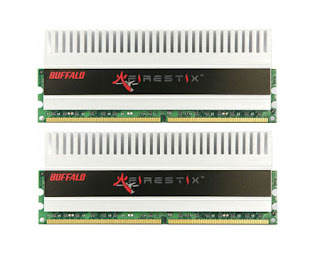 Buffalo company, after Christmas, released a new pair of DDR3 modules with 2200 Mhz . This is the fastest RAM made today. But only drawback is, it requires high input voltage. This is the new "FireStix FSI2200D3K-K2G" at considerable 2.1 volts. Normally DDR3 Ram requires 1.8 Volts. This 0.6V difference is very considerable size. Because of high voltage it can be used at timings 9-9-9-24. Its really helpful for overclockers. This 2*1 module will soon appear in the market. The price is not out.